TV psychic Uri Geller has claimed responsibility for the leak that brought proceedings in the Commons to a halt earlier today. The Israel-British mentalist had previously warned Theresa May that he would use his "powers" to bring an end to the Brexit chaos. He apparently carried through his threat today, claiming in a statement on Twitter that he had bent the Commons pipes with his mind. Unfortunately Mr Geller's powers were in vain, as MPs were debating Loan Charges, rather than Brexit, when the leak took place. A Downing Street spokesman has confirmed talks between the government and Labour will continue tomorrow. The negotiating teams met for four and a half hours of "detailed and productive technical talks" today. Shadow Brexit secretary Sir Keir Starmer led the Labour delegation, while Theresa May's deputy David Lidington headed up the Conservative team. In a joint letter to Mr Corbyn, 25 Labour MPs warn that a second public vote would "divide the countr yfurther and add uncertainty for business". They warned: "A second referendum would be exploited by the far right, damage the trust of many core Labour voters and reduce our chances of winning a general election." However Labour chairman Ian Lavery told shadow cabinet colleagues on Wednesday that a second referendum would split the party. The Bill - passed by a single vote in the Commons on Wednesday - allows Parliament to determine the length of any Brexit extension the Prime Minister should request at the EU summit on April 10. The prime minister's official spokesman said: "If passed, this Bill would place a severe constraint on the Government's ability to negotiate an extension and reflect this new date in UK statute books by April 12." 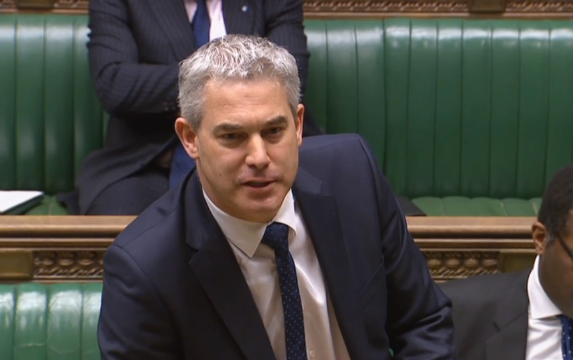 Brexit secretary Steve Barclay has warned that UK participation in European Parliament elections would be "damaging" for UK politics. Mr Barclay replied: "To have European parliamentary elections three years after the country voted to leave would be damaging for our politics as a whole, but he'll also have seen the vote in the House last night which sought to take the option of leaving without a deal off the table, and he'll also be aware the House has today refused to back any of the options for a deal that have been put to it." Brexit minister Robin Walker, asked if the department had analysed the cost of running a second referendum and whether it continues to not be government policy, said: "I can certainly confirm the latter. "A second referendum would create further uncertainty and further division. We don't think it's the right way forward."